Rumi, the ancient Sufi mystic and poet, used to write: “If you desire healing, let yourself fall ill, let yourself fall ill”. I like this quote. In my understanding, it means that in order to experience true health, which is our natural state, we need to undergo a certain cleaning. We need to remove things which don’t belong to the natural state, which become barriers to our experiencing it. I think this wisdom can be applied to all aspects of our life. When I try to apply it to my work and my aspiration to create a perfect customer experience, I realize that a perfect experience doesn’t need to be created. More often than not, to make our customers happy we just need to remove things which stand in the way of effective and positive communication between us as companies and our clients. In a way, it could also be called a cleaning process, or healing process. And the first step is, to recognize these barriers which obstruct the ideal experience, or to let yourself as a company fall ill, which means allowing space for mistakes and for their recognition. Below are 10 most common and most significant mistakes which Provide Support team recognizes in our own interaction with clients and which we are trying to avoid. I hope some of these points will drive your attention where perhaps it is most needed at the moment and will help your customers to have a truly outstanding experience with your company. How a customer service agent is approaching a client, his/her attitude toward the client is extremely important. It may seem that some technical aspects of how support is being offered have bigger impact. However, in my experience, the quality of a personal interaction between the agent and the customer always has bigger contribution to how customer evaluates his experience. This is also confirmed by the results of Genesys Global Survey, which show the 78% of customers say that competent customer service reps are most responsible for a happy customer experience. In my opinion, indifference lies at the root of all other barriers to a great customer experience. It is what nurtures slacking and creates a negative impression in customers, that’s why I put it as the first and the most significant barrier to outstanding customer experience. I recommend reading these 2 posts here and here if you would like to dig into this problem deeper and how you can solve it. The natural consequence of indifference, inattention to the voice of the customer also creates a negative impact and make the customers feel as if their business is unimportant to you. Customers want to be heard. Not only they expect you to understand their problem and offer a solution, but they also want you to hear their feedback, their complaints, compliments and suggestions. They want you to notice what they say, react to it and respond. A lot of the times a customer’s issue requires a follow up. I’ve seen many cases like this that a customer service agent and a company as a whole do not have the necessary commitment to lead the customer to the end and ensure that his problem is solved and the customer is satisfied. Perhaps it is even worth having a separate person in your team who would be dedicated to the monitoring of this situation and making sure that follow up with customers is performed where it is needed. Some of the more complicated customer service issues imply a second interaction. It may happen that the customer was served perfectly well during the first one, but when his issue is escalated to another person, or he gets in touch with another team member during a second interaction, he experiences disappointment. The need to explain the issue a second or third time, or sometimes different answers, different interpretations of the company policy given by agents, can greatly diminish customer experience. Make sure that your team is strong and gives consistent experience to the customer. All members of the team should work in cooperation, every link of the chain supporting the next one. Unite your people by inspiring them to give their best to clients. A few customers shared with me that whenever they contact support, a lot of the times their problem is interpreted to be larger than it is. 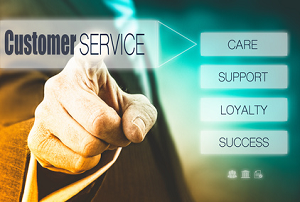 In fact, 80% of the customer service issues concern the basics of your product or service. They don’t require any special skill or knowledge or even investigation on the part of the agent. Overworking the problem can be as damaging as underworking it. Good knowledge of the product or service, attention to the customer’s explanation of the issue and some degree of intuitiveness will help the agent to see the real scope of the problem and give the fastest and the simplest solution. Customers desire authenticity and dislike overly scripted service. Many companies, unfortunately, deviate into scripted communication with their clients. Partly, it happens because it is easier for companies like this. It also happens because companies don’t trust the discretion of their employees that they can sort out the client’s problem. So they give them canned responses to send to customers. To break this vicious circle, as a company you need to have trust in your people and their potential, their interest to be of help to you and the customers. And secondly, you need to inspire them. Inspire them to trust in themselves and be creative. Creativity is hardly needed when communication happens in the present moment, when it is not prepared in advance. How to inspire creativity in your agents, read on in my other post here. Technical aspects, of course, also matter in the customer experience. You need to make sure your clients have easy access to support when it is needed. They will highly appreciate the convenience. How can you ensure easy access to support? Put yourself into your clients’ shoes and browse your website. See if you can find the contact options on your website and all of them are working and your agents are responding. Taking care of the technical side of it is not so difficult, but it also takes some time and dedication. Customers find it important that the company has access to their previous transaction history and their personal details. Recent CX Act’s research revealed that the degree to which customers’ information is used by the company to provide a personalized solution is in direct correlation with the degree to which customers perceive their support interaction as quick and easy. Not collecting any customer information, as well as collecting but not making use of it is equally damaging to how customers perceive your support. Make sure that you are asking your customers only that information which is needed and you are using it to the maximum to provide better service to them. Statistically, if customers get a solution to their problem in the first call, 92% are likely to continue using the company, 86% are likely to recommend the brand, 88% are likely to spread positive word of mouth about the brand. This leads to much higher levels of loyalty and advocacy, better perception of your company. There are way too many benefits to low first call resolution to ignore this factor. Check out our nice infographics on how to measure and improve your first call resolution. Nobody likes waiting. Long hold times are one of the most frequent cause of complaint and dissatisfaction by customers. This seems like the easiest thing to fix. However, many companies still overlook this important aspect of good service as fast reaction to a customer service request. It is like getting back to basics in customers service, that’s why I put this factor at the end of my list. There is a lot of work ahead to eliminate all the above mentioned barriers and allow the perfect customer experience to happen. Perhaps, your company has already overcome these and is struggling with some other issues? Have your voice in the comments and let us know what other barriers to outstanding customer service you think are significant and important to overcome in your business. This entry was posted in Articles, Best Practice, Tips and Tricks and tagged barriers to customer service, customer service mistakes, ideal customer experience, outstanding customer experience, perfect customer service. Bookmark the permalink. This is a good list, Maria. The challenge for many companies is helping employees overcome these barriers. They’re sometimes much more difficult than people realize. Inattention is a great example. Most customer service jobs create inattention: agents have to use 5 – 7 different programs per contact, they have to filter out extra noise, they see the size of the queue and feel pressure to move quickly, etc. Agree with you, Jeff. The challenges are many and it’s not easy to overcome them. Otherwise, it would have been a perfect customer service world now 🙂 Our common effort, such as blogging and your book, I think, help to bring awareness to many of those issues and motivate companies to steer for a change. I think delayed response is what bothers me a lot. If a customer is having some sort of complaints or queries, they are supposed to be resolve quickly. I think this should be the basic rule of Customer Service. Thank you for sharing your experience, Sarah. I am sure many customer service providers will read it and make note of it. It is true that a lot of the time, unfortunately, we still overlook the basics while focusing our attention on more complex things. A very interesting list. You seem to be focusing on employee barriers, as Jeff explicitly points out. In my opinion, the number one barrier is management, and poor managerial process. Most of the items on the list are a result of poor managers rather than poor employees. We cannot manage employees like we used to, in the Taylorian age. We need employees that are willing to see the big picture and take accountability. That is management’s responsibility, but it doesn’t stop there. If we don’t manage the employees well, they will leave, or worse, they will stay and exhibit a lot of the tendencies on your list. Thank you for your valuable comment, Moshe. I do agree with you. Ultimately, everything is interconnected and poor employees performance could be blamed on poor management and poor management – on poor CEOs work etc., while the seed of the company success lies in how much vision, energy and inspiration the company founders put into it. So we could also say that a company’s failure in customer service is the result of the wrong company values or their transmission down the line by the company heads. At the same time, it is the responsibility of each member of the team to give their best to the customer, in whatever form their position implies this. So I believe the team should be aware of how the front line interaction with the customer is happening and what real challenges need to be overcome there. Hence, my reminders. Thanks again for your insights. Thanks for a thought-provoking examination of a very important topic that I believe most businesses are failing dreadfully at in the digital era. You are definitely right to focus on the barriers to delivering exceptional service today. However, I believe this is just the tip of the iceberg of the customer service issue we have to resolve. The issue for me is that businesses have taken the approach of trusting technology, more so than thinking clearly about the other aspects of delivering great service. Take the example of high-end restaurants. Most make sure that the customer experience is truly memorable from beginning to end. This does not happen by accident as it is the reason they are high-end and charge more in the first place. Of course, the customer can expect excellent food as well, but that is just one part of the deal. These businesses are designed to go the extra mile to thrill customers. They don’t wait until something goes wrong to show their customer service credentials. E-commerce businesses should be asking themselves what they actually do to leave each and every customer float in a cloud of satisfaction as a result of doing business with them, and then plan to ensure every customer gets that feeling. That is what gets repeat business and brand advocacy! Eny, thank you for your thoughts. I do agree with you about going the extra mile and creating a memorable experience. It is truly for those aspiring for the highest heights. But this also cannot be achieved if the basics are overlooked. I’d say, if we take the example of restaurants, even if the service is superb and there’s great entertainment offered, but a soup is served with flies, the questions of repeat business and advocacy will not arise. It’s like building a house: first the basement and then the roof top. Without either of these, it is incomplete. Thanks for your addition. Will be happy to read your post, please link. I agree with everything everyone is saying. The most important thing is to make sure the customer is satisfied in a timely manner. Long hold times or repeated call-backs are a big issue in e-commerce. Perhaps noise-cancelling headsets would alleviate some attentive issues and get the customer well deserved 1 on 1 interaction. In some cases, the call must be escalated to management, but that should be rare with properly trained personnel. In my experience, the most daunting task is inputting all of the customer’s info when the customer is already upset. This is where empathy, attentiveness, and creativity come in. Just relate with them. They will calm down. Thank you for your comment, James! You couldn’t be more right mentioning the difficulty needing to enter the customer’s information when the customer is upset and the operator’s attention needs to be fully with the customer to calm him down. I would call this one of the most difficult customer service skills. Or perhaps a chance to reconsider some of the common support center workflows and become creative about it ). Thank you for this explanation. I am currently working on barriers to service quality and would like to have your comments on that please. I believe the above comments are spot on but, however the representative’s ability to remain calm and still address the concerns of the customer is key. This is a very well-researched post. And I do agree, that by being indifferent or by providing scripted answers for a customer query a company can turn away a valuable customer. In order to provide exceptional services and to maintain a good relationship with their customers, companies do need to recognize and overcome the barriers that are mentioned here. Thanks for sharing this article. Really helpful! Thank you for your feedback, Drahul! I’m glad the post was helpful to you.